THIS IS WHY THERE NEEDS TO BE AN INDEPENDENT FINANCIAL ANALYSIS!!!! Hmm, you’re right… I hadn’t really dug into that portion of it. I’d guess that $6.1 million was lost in the market…? But the thing is, they must have made some REALLY TERRIBLE INVESTMENTS if they lost 6%-ish in that time. In the MPR article, it says the fiscal year ended in August 2012. So I’m *guessing*, unless they’ve changed dates, that fiscal year 2007 lasted from September 2006 to August 2007. In September 2006 the Dow was at roughly 11,500. At the end of August 2007, it was 13,300. So roughly a 13% gain. http://www.fedprimerate.com/dow-jones-industrial-average-history-djia.htm The S&P was at 1311 in September 2006; by August 2007, 1474. So again, roughly an 11% gain. Nowhere near a loss. http://www.fedprimerate.com/s-and-p-500-history.htm Even if they’re not talking fiscal years, and are talking calendar years, the Dow went from about 12400 in January 2007 to 13264 in December 2007. The S&P went from 1409 in January 2007 to 1468 in December 2007. Pretty impressive gains. So if this discrepancy IS due to losses in the market, they’re admitting they WAY under-performed, like to the tune of 15%+ or possibly more, and I don’t think it’s unreasonable to ask what exactly happened there. You could probably go year by year and see how if they under-performed or over-performed the market; that might be an interesting analysis. Maybe I’ll go through all that eventually; I don’t know. I feel uncomfortable doing it because I don’t know a lot about how that sort of thing is done. So yeah, FANTASTIC question. They should have explained that. I don’t *think* they have. You have to be careful with market analysis. Up markets can still lead to losses in portfolio investments if the funds manager isn’t on his or her game. The two, market health and returns on investments aren’t always directly proportional. Having said that, there’s a tiny outside chance they’ve been cooking the books and using the funds manager’s supposed underperformance as a means of scapegoat. In situations like that, all the books (/electronic filing records) need to be looked at by an auditor. Little discrepencies here and there will show up only when a true accounting is given of the finances. Little discrepencies are hardest to hide. Interesting stuff; thanks for sharing. A couple points related to your writing – I do not claim anyone is lying/truthing/etc. This is merely information to consider. I like numbers. THIS IS LONG. I hope it makes sense. If not, please let me know & I’ll fix it. 1 – why are the numbers different in the earlier years? Accounting methods change from time to time. It is possible that expenses/income are not being calculated using the same equations today as in ’04. This does *not* mean fraud or deception is occurring. Simply that an analytical tool changed. If this is the case, a professional financial evaluation (read: audit) would take this into account, because the Orchestra’s accountants would be talking to other accountants and they could explain what changes occurred. 2 – calculating average % draw. I would question the use of the non-specific years that are “7% or less”. It’s not always a good idea to try to calculate with real numbers and with words. Separating the numbers into “all, including guesses” and “the years with specific numbers” is better, as it clearly indicates a level of mathematical confidence. 3 – what is “average”? When comparing numbers which vary greatly, the “average” might not be the best number to use to explain the meaning of the collection of numbers. The median might give a different picture than the mean. the mean here is 9.5. The ‘median’ is the number in the middle of the numbers listed; half of the numbers are greater than this value, and half are lower than this value. Here is where you can accommodate for having a single huge number. It gives a different picture relating to a *distribution*. The median of the above numbers is about 7.2. So, if you want the average which is the median, it’s 7.2; the average which is a mean is 9.5. This begs the question of *how* averages are calculated, as well as which numbers are used to do the calculating. 5, 10, 12, 15, 16. If you look at the 2nd and 3rd examples, the last number changed hugely, but the median is the same. If you have one year with a huge discrepancy, you can use the median and it will be looking at the Big Picture’s Distribution. This is often done with comparison of income. Go back and look at the above numbers and imagine them to be wages in dollars per hour. If you only look at people with similar incomes (the first set of numbers), then the mean and median are almost the same. Once you add in Bill Gates, in the 3rd set of numbers, suddenly you can claim “Our average pay is $26”, which ignores the fact that 5 of the 6 people make less than that figure. 4 – definitions change of time. The same activity/cost can be considered “public relations” one year, “professional development” the next, and “miscellaneous” the next. 5 – absolute values and percentages can get mixed together to provide a murky, confusing or even meaningless picture. As a note, the numbers in this point are confusing, because there’s no real explanation about what I mean — which might be the situation with the orchestra, where no one really is using the same numbers in the same way with the same meanings. which is the average (mean) of the %change, *not* the %draw, which we’ve already decided is either 7.2 or 9.5.
because this takes into account the various ups and downs from year to year. And your last line is also brilliant. whoa! the 2 column of numbers just before the end looks horrible, with all of the spaces taken out. If this looks horrible when you post it (if you do), please let me know – I’ll take it out and re-post it without that point. I’m enjoying reading your blog here. 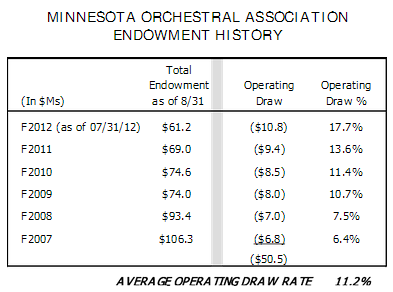 I compared this chart to the MN Orch 990 (tax form for nonprofits). First, the end of year balances in the chart match the tax forms. Good. The tax forms also include beginning of year balance, contributions, investment earning (or loss), expenditures, and expenditures for current operation. Current operations rough translation: $$ from the endowment that help run the orchestra on a day to day basis. They help the infamous bottom line to make up for losses. The figures for draw above do not match either the “expenditures” or the “expenditures for current operation.” In all cases, the “operating draw” on the chart is HIGHER than the “expenditures for current operations” on the tax forms. The instructions for the 990 sometimes tell you to exclude things that are included on your financial statements. I have a decent understanding of the 990 – until you get into the area of pensions (being underinvested) and endowments. Yes, there needs to be – if not a full audit – another set of qualified eyes on the financials that can explain this. At least to the Board and to the musicians. Not sure if the public at large wants to know although I certainly do! P.S. Emily – their audit states that donations to Hall renovations are reflected as temporarily restricted funds. They are not included in this chart or in the endowment. Thank you, Mary!! I think the public at large SHOULD know, if they want to! If there wasn’t so much at stake with this upcoming contract, then maybe it would be more irrelevant. But when so much is at stake re: the quality of the orchestra, then yeah, any well-informed opinions about financial analysis become more and more valuable. IMO. Oh, another question – Do you know if the roughly $50 million that’s non-hall related (for artistic endeavors, touring, and shoring up the endowment, etc)…do you know where those contributions fit in? Should they be in the chart? I’m so sorry if these are stupid questions; I’m just, as they say on the internet, a total n00b to this kind of stuff!!! Thanks for sharing your expertise, and I look forward to hearing more. Emily, I love your blog! Your writing is very inspiring! I check your site every day. Emily – not a stupid question at all. It’s clear on one part of the remaining $60M. The $30M for the endowment – is for the endowment. The $30M for artistic and educational projects is unknown. I can’t find it referenced anywhere in the 990 or audited financials. FISCAL YEAR Their fiscal year begins Sept 1 and ends Aug 31. What is referenced as F2011 is the fiscal year that ended 8/31/2011. MARKET LOSSES On market losses, there was a sizable loss in 2008 for the endowment. That was true of absolutely everyone, corporate or individual accounts. I’m not an investment analyst so wouldn’t even try to analyze whether their returns are reasonable. The projections for their strategic plan made in 2007 assumed a much larger return for years 2008 and on, and a much larger value of the endowment. http://www.minnesotaorchestra.org/pdf/strategic_plan/#/10/ Happened to lots of people and organizations. My question is whether they’ve done a modified assumption going forward. Haven’t seen anything. I hope they’ve at least done something internally, but the Contract section of the website all links back to the strategic plan (published late 2011). Again more questions than answers. Maybe the Orchestra should have sued to recover some of their lost investment money, too. It makes me feel all warm inside to know that the current chairman of the Minnesota Orchestral Association board of directors is an executive vice president at … wait for it … Wells Fargo.